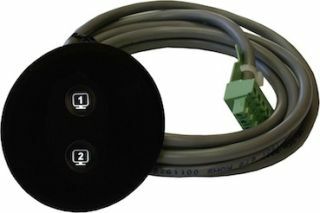 Altinex has released the AC301-250 Dual Button Controller for use with the company’s UT250-101 under table switcher. The AC301-250 works in conjunction with external video and audio inputs mounted into the boardroom table, underneath the table, or anywhere else in the room. Simply match the video input number with the controller’s input number and each user enjoys their own personal presentation control. As the Altinex UT250-101 matrix switcher supports eight inputs, as many as eight AC301-250 Dual Button Controllers can be connected—enabling each person to direct their video to one of the switcher’s two dual outputs. Each user can select to which monitor their laptop’s video is directed; output #1, #2, or both. The audio output from the switcher follows the last control panel selection. Featuring illuminated output select control, the new Altinex AC301-250 Dual Button Controller is easy to use when the room lights have been dimmed. Each subsequent press of either output select #1 or #2 toggles On/Off operation. At just over two inches in diameter and nearly flush with the tabletop, the AC301-250 user interface is stylish and unobtrusive. Installation of the AC301-250 requires only a 1-inch hole saw. There is no need for a router or expensive machining. Simply cut the hole and clean the opening and table surface. Next, route cables, test and verify for proper operation, then remove the AC301-250’s adhesive backing and place the unit into the table opening. The Altinex AC301-250 Dual Button Controller is available now with a MSRP price of $126.